"While Robonaut 2 has been busy testing its technology in microgravity aboard the International Space Station, NASA and General Motors have been working together on the ground to find new ways those technologies can be used. The two groups began working together in 2007 on Robonaut 2, or R2, which in 2011 became the first humanoid robot in space. NASA and GM now are developing a robotic glove that auto workers and astronauts can wear to perform their respective jobs, while reducing the risk of repetitive stress injuries. Officially, it’s called the Human Grasp Assist device, but generally it’s called the K-Glove or Robo-Glove. 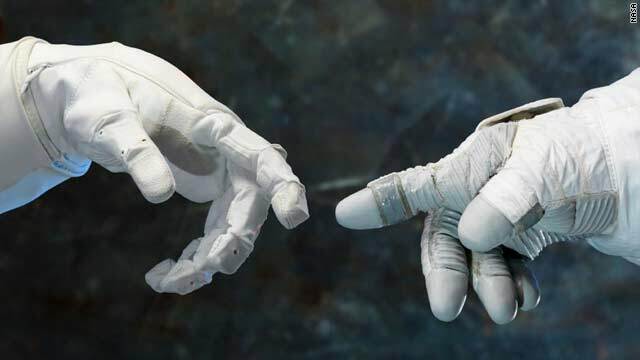 In this image, Robonaut and a spacesuit-gloved hand are extended toward each other to demonstrate the collaboration between robots and humans in space."